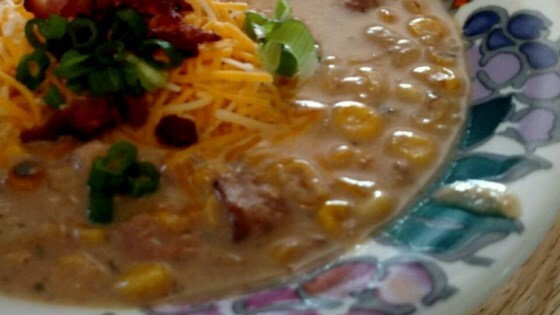 "Roasted fresh corn and potato chowder is hard to beat on a chilly day! For a twist, add just a few ounces of smoked salmon and have an incredible British Columbia-inspired smoked salmon corn chowder. Had this in a little cafe on a dock in Vancouver, BC while waiting for a sea plane to take me to the outer west coast of Vancouver Island for a late season salmon fishing trip. I spent several years playing around with it to recreate it. Don't know if I matched theirs exactly, but I have come up with this basic roasted corn chowder recipe that turns into a great smoked salmon chowder, too." Melt 1 tablespoon butter in an oven-proof skillet over medium heat; stir in corn and tarragon and cook, stirring occasionally, until corn begins to brown, about 5 minutes. Place skillet with corn in the preheated oven; roast, stirring every 5 minutes, until lightly browned but not dry, about 20 minutes. Place bacon in a Dutch oven over medium-high heat; cook, turning occasionally, until evenly browned, about 10 minutes. Remove bacon slices; drain on paper towels. Pour off all but 1 tablespoon bacon fat. Heat reserved bacon fat in Dutch oven over medium heat; stir in onion. Cook and stir until onion has softened and turned translucent, about 5 minutes. Reduce heat to medium-low, and continue to cook and stir until the onion is very tender and dark brown, about 15 minutes. Pour chicken stock over caramelized onions; stir, scraping the bottom of the pot to dissolve any browned bits, and bring to a boil. Stir potatoes, parsley, garlic, celery, and paprika into onion mixture. Crumble bacon, reserving about 1/4 cup for garnish, and stir bacon into soup. Reduce heat to low; simmer until potatoes are tender, about 30 minutes. Stir remaining 2 tablespoons butter and half-and-half into soup; season with salt and pepper. Sprinkle reserved bacon and Cheddar cheese over soup to serve. You can add smoked salmon about 10 minutes before the end of the cooking time. Smoked salmon is strong; start with a couple ounces, then add more to taste. Season with salt and pepper just before adding the butter and cream. As the stock reduces, the salt will concentrate, so it's best to taste and season several times during the simmer. If you have time, chill and refrigerate the soup for a day or two, then reheat to serve. I made this as written except I used fresh tarragon and fresh celery. We thought it was pretty good and will make it again. I will use half the bacon next time. Wonderful recipe wig good flavors. I don't like tarragon so substituted thyme and also added a can of green chilis for spice.